Download a copy of the pattern on Midnightsky Fibers here. Also available in print from Magcloud. 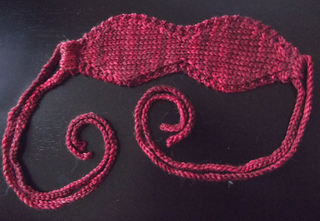 Double crochet ties that pull through loops on either side so the mask can be tied with a bow at the back or side of the head. Increasing and decreasing shapes the eye covers and provides minimal bunching at the ears and nose. Facemask (excluding ties) 8.5 inches long by 3 inches wide at the widest. Ties are 28 inches long and folded in half to be 14 inches.